When Jennie Gilchrist fled from the Scottish Estate of Linnmore during the fiery violence of the infamous Highland Clearances, she planned to make her way to her sisters in England, but instead she found herself sailing on the brig Paul Revere, bound for the coast of Maine--the New World. Accompanying her is Alick Gilchrist, cousin to her late husband, now a fugitive. Jennie feels obligated to help Alick escape Scotland, as she is partly to blame for his outlaw status. SInce the sponsor of the trip requires that all immigrant men aboard the Paul Revere be married, Jennie sails as Alick's "wife", the pair traveling under an assumed name, with little aside from the clothes that they wear. They arrive at the small but thriving town of Maddox on the newly settled Maine coast, unlike any place they have known before. They immediately set to building a new life for themselves--Alick building boats, and Jennie teaching the well-to-do MacKenzie children--but while Alick is fixing to live out his days on American soil, Jennie is biding her time and saving money for the passage back to England. But unforeseen events derail her plans, not the least of which is her bond with the inscrutable Alick Glenroy. 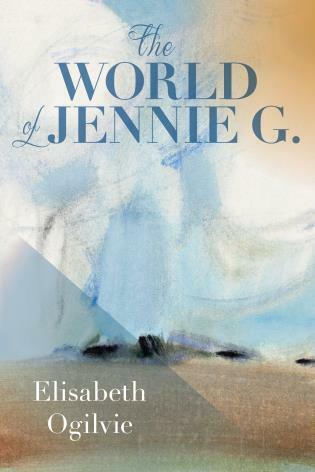 Elisabeth Ogilvie wrote 46 books including Jennie About to Be, Jennie Gilroy, and the Tide Trilogy. In 1947 she won the New England Women’s Press Association award for Storm Tide. Ogilvie grew up in the greater Boston area, but lived in Maine from 1944 until her death in 2006 and remains one of Maine’s best loved writers.